I was really tired of the fighting about the brushing of the hair, and she was really tired of the knots knots knots. We talked about it, and she decided that a haircut would be okay, and that she would like to donate her hair for a wig for someone with cancer. 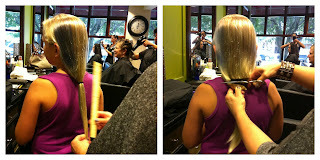 I was vaguely leery about Locks of Love, and was leaning towards the Pantene Beautiful Lengths program, but it turned out that the salon owner was about to take a huge bag of hair down to a local wigmaker, so into the bag went my girl's tail. It was the only blonde hair (with a faint blue streak) in the bag. Adorable! She looks so much older too. Red's hair is super long these days. Maybe I can convince her to do this eventually. How thoughtful and generous of her to donate her beautiful hair. Beautiful - the girl and the sentiment! She looks great inside and out. Nice move. It'll be a lucky person who gets that hair! Well done, Girlie. And the haircut is adorable. yay! 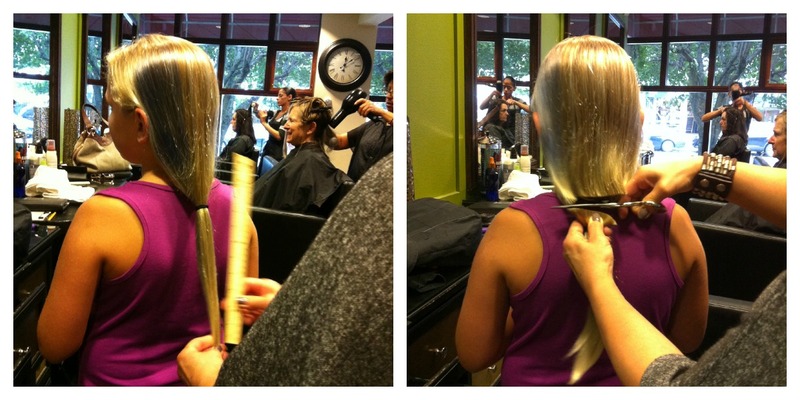 she looks wonderful, and her hair is going to help someone else feel wonderful, too. win-win. She looks so cute! Like! That's a win-win: great haircut and a great cause. Lovely hair for a good cause.